The newly released “Roadmap to 100% Renewable Electricity” report details a plan for CMS to transition fully to solar energy using photovoltaic systems like the ones pictured above. 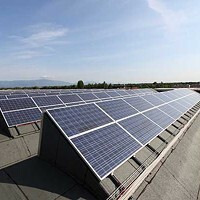 PV systems could be installed on rooftops, on custom-made structures covering parking lots or be gound-mounted. 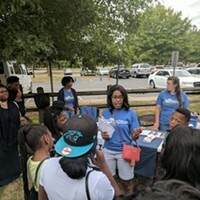 Just weeks after the release of an extensive report detailing ways in which Charlotte-Mecklenburg Schools could conceivably transition completely to solar energy over the coming decades, the path to making it happen remains unclear. The report, created by the North Carolina Clean Energy Technology Center at North Carolina State University, describes how CMS could meet 100 percent of its electricity needs through on-site photovoltaic solar installations at schools, saving the district more than $1.5 million a year in the process. 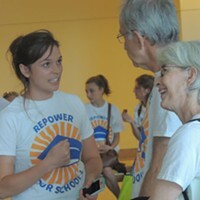 Members of the Repower Our Schools (ROS) coalition presented the report to media members in Uptown Charlotte one early February morning that would have been more conducive to wind energy than solar. The report and blustery press conference got some attention in local media and quickly cycled out, overshadowed by a school board divided over a new school assignment plan and the superintendent (see page 14). So the question remains: was CMS listening? And, if so, how far out would the district be from implementing something like the plans described in the report? "I'm not taking this and throwing it in the file and coming back to it in six months," Phil Berman, executive director of building services for CMS, says. "I develop goals and objectives for everything I do with my staff and I hold people accountable. This report has been and will be part of our goals and objectives, as will driving energy efficiency." The CMS staff, board members and legal team received the 90-page report on February 1, and when I met with Berman 10 days later, he had a heavily highlighted version of it laid out on the conference table in front of him, along with a number of related articles printed out and pages of notes about his thoughts on the report. "I feel like I've been studying for a college exam," he says, laughing. Berman, who has been with CMS since 1988, understands that solar is the future and, at some point, the district will need to move away from its coal- and nuclear-based energy sources. About 95 percent of the energy currently used by CMS – $18 million worth annually – is generated by fossil fuels and nuclear power. "I'm a firm believer that solar power is the future. Maybe not in my lifetime to where it's widespread, but every report and study I see says that in that 2040 to 2045 period, it's got to happen," Berman says. "We're in a transition with fuel and natural gas. Coal is the dodo bird; it's the dinosaur. I'm comfortable that they say this is our hope and the study achieved that." On-site solar installations that serve each and every school in CMS are the end-goal for CMS and the ROS coalition, but both organizations have some work to do before the idea can reach its full potential. "We are not expecting this to happen by any means tomorrow. This is a long-term commitment and we understand that," says Monica Embrey, a Greenpeace climate organizer who works with ROS. (She dragged out the word "long" for emphasis) "The timeframe is completely dependent on how quickly we are able to make improvements to policies that allow schools to go solar faster and easier." The policies she refers to are North Carolina laws prohibiting power purchase agreements (PPAs), in which a third-party owns a solar project and sells the generated electricity directly to a customer (schools in this case). As policy stands now, any energy created by a solar installation is either used by the owner or sold back to the utility company – Duke Energy in about 85 percent of the state – at a much cheaper rate than Duke would then sell it to customers. A PPA would allow the third-party owner to claim tax credits and sell energy to schools at a cheap, stabilized rate. With the current laws as they are, CMS would need to enter into a "partnership flip," co-owning any solar projects with an outside investor, who could claim tax credits the schools couldn't. All energy created in a partnership flip project would be sold back to Duke for renewable energy credits (RECs), which exist in a shadowy Wall Street-type of exchange. CMS would "retire" the RECs they received from selling energy back to Duke, allowing the district to claim to be "powered by" renewable energy regardless of what source the actual energy used in classrooms is coming from. Also, the proposed $42.1 million that could be saved through a partnership flip is reliant on the assumption that each and every project would be awarded government-issued clean renewable energy bonds, which is doubtful. For these reasons, along with the complicated legal and administrative processes that come along with partnership flip, many CMS officials don't see a full district transition to solar energy as realistic until policies change and PPAs are allowed. "I strongly agree that we're getting closer and closer to where this time will come," Berman says. "Obviously, we're in a state that has some legislative issues and barriers and we're dealing with those as well. The time to where the economics might be the driver for this may be a little longer." It's estimated that a transition to solar using PPAs could save the school system $54.6 million over 25 years, and without any reliance on government-issued bonds for each project. According to the report, that would equal 1,357 starting teacher salaries or more than 900,000 textbooks. House Bill 245, or the "Energy Freedom Act," would allow third-party sales and PPAs. The bill was filed in the North Carolina General Assembly in March 2015, and has been stuck in a committee since August. It's not expected to come out of committee during this session. The question now is whether the Charlotte-Mecklenburg Board of Education will throw its support behind the new report and push for the passing of the bill. Thelma Byers-Bailey, a board member and member of the Intergovernmental Relations Committee, says she hasn't yet read the report but the committee plans to study it and decide whether to recommend that the Board of Ed take a legislative stance in support of HB 245. "I am in favor of moving CMS toward the use of solar whenever and however we can, and as soon as possible," Byers-Bailey says. "It's my understanding that there are some legislative hiccups and there's some opposition from energy suppliers. Assuming we can get over those issues and any issues about how it's set up and who pays what – in theory – I'm in favor of it; as an educational tool, an economic reduction in expenses and making our bottom line as low as possible." Duke stands against the Energy Freedom Act, concerned with allowing third parties to become competing energy utilities. Duke spokesperson Randy Wheeless said that in order to gain his company's support, legislation would need to address issues other than the PPA question, such as the renewable energy tax credit that once led to a solar boom in North Carolina but was allowed to expire by the legislature on January 1. "A better tactic would be to bundle various solar issues together in a piece of legislation instead of fighting over one divisive topic," he says. "When you look at other states, battling over one issue is not productive and helps no one." The board will also hear from Berman sometime this year before deciding its stance, but until then, he and his staff will remain proactive on reducing energy use in the lead-up to a potential transition to solar, he said. Currently, 76 of the 168 schools in CMS are Energy Star certified by the Environmental Protection Agency, meaning the schools use 20 to 30 percent less energy than federal standards. The ROS report suggests that the district reduce its current usage by another 15 percent before beginning any large solar projects. That's not something Berman needed the report to motivate him to do, he said. He's been pushing for better energy efficiency since creating his first annual environmental report for the board during the 2005-06 school year. He is working on installing more energy efficient equipment (his staff is currently looking at freezers) while continuing to preach behavior modification that can drive down usage. Work like this has improved energy efficiency in CMS in recent years, but one gets the notion Berman doesn't rest as long as he knows there's room for improvement. "I need to do behavior modification with some of these athletic directors," Berman says, visibly stressed while thinking about the hours he's spent on this issue. "Now and then I just get in the car at night and go to certain schools and the lights in the gym are on. Those lights shouldn't be on." He also wants to begin researching the potential for a small-scale "pilot program" introducing solar to schools in the district, with or without policy change. His staff has studied Sandy Ridge Middle School in Hoke County, one of only three schools in the state to transition fully to solar energy. Sandy Ridge is expected to save $16 million on energy costs over 40 years, and that single school is smaller than most schools in CMS. His staff is looking at schools with strong STEM (Science, Technology, Engineering and Math) programs as possibilities for a pilot program, so that an installation could be used in the curriculum. He mentioned Olympic High School as a location he has looked into, but research is preliminary and staff is nowhere near any concrete decisions. He said he had created a briefing for former superintendent Heath Morrison based on Sandy Ridge, but the issue was brushed off following Morrison's abrupt resignation in 2014. "From my own standpoint, if we wanted to do a single school project just to get our feet wet, it might fit best as (the Sandy Ridge) model," Berman says. "But there's a reason only one school has done it; you have to build a collaboration and have a lot of support to get it. Whether that is possible, I can't tell you at this point. But I'd like to resurface with this idea and at least start briefing people." Whether the ROS report will be the first step in changing how CMS acquires the energy it uses is still up in the air, but to hear Berman speak, it's only a matter of time. "In the end, we always have to look at the funding and other priorities in context, but it doesn't mean we shouldn't continually try to advance toward that goal," he says. "We may not always advance at the rate that (ROS) wants us to, but maybe we will, I just can't answer that yet."